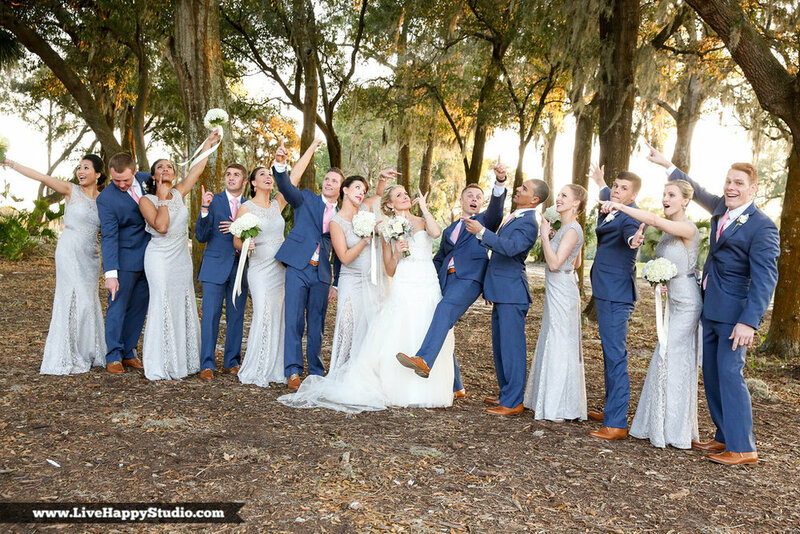 Putting the FUN into your Wedding Photography! Your wedding is a pretty big deal, there is a bunch to organize, so many decisions to be made, and months of planning every little detail. When it gets to the big day its time to chill out and let it all happen, remember you have put together your perfect team of vendors to be there for you every step of the way. Wedding photography is a big part of the day and we know you want to look good, trust me when I say you will… especially if you're having fun! We like to have fun with all of our clients, your wedding should be the happiest day ever, not the most stressful. So here's some tips from us to make your wedding day more fun, and your images filled with smiles and laughs. 1. Be yourself: People look their best when they are relaxed, so don't over think the photographer! Do what you normally do and have fun doing it (just pretend we are not there - it's pretty easy with us as Kellie is only 5ft tall so she's easy to miss). We'll be there to get all the amazing moments without you worrying about "faking it". The best smiles are the real ones, a "cheese" smile only uses the muscles in your lower face, a real smile (one that lights up a room) comes from the eyes. You can't fake a real smile, so instead of worrying about how you look or if your arm is in the right place, just have fun. 2. Don't worry about time: Stressing about timing isn't going to make your day any more fun, plus it means you're going to look stressed in all of your pictures! Let the people you have hired do their thing and don't worry about time. Most couple we work with seem to think they are late when they are not. Slow down and enjoy the day. As photographers we know we have a set amount of time for portraits and that’s why we move quickly. If your ceremony is running a few minutes behind, don't worry, we'll work on fast forward and make sure you get to dinner on time :) It's our aim to get all of your images done asap so you can relax or even join your cocktail hour. 3. Ridiculous portraits: OK, so we need the traditional family portraits, we'll make sure we get those done first, then its time to have some fun. There's always one person in a wedding party that’s up for anything, we like this person, and I usually ask who it is - all fingers usually point in the same direction :) Remember that not all images have to be pretty and perfect, why not have one where you are striking a pose, being chased by a T Rex, or pointing in different directions for no reason at all. Not only do these moment create fun images, they also create a moment for us right after that portrait to capture candid moments of you all laughing at how silly you just were. 4. Don't sweat the small stuff: There are a million little details that you pull together for a wedding, if one tiny thing didn't work out don't worry! So many couple are concerned that something isn't right for the guests. The likelihood is that people didn't notice the different type of flower in your bouquet or that the place setting was the wrong color! It will look amazing and your guests will love it, and we'll be there to make sure every little detail is captured. 5. Don't be afraid to show off your sweet dance moves: We love all the special moments that a wedding brings, but some of the most outrageous are the ones from the reception. If you're on the dance floor then everyone will be on the dance floor, and that makes for some pretty cool pictures, especially when your 92 year old granny who never dances decides to jump on the dance floor and grind it up (yes, that happened). Drag them all on the dance floor and make them show you their moves.... even if they don't have any it will make for great pictures. Your wedding day really will be one of the most memorable in your life. Focus on the fun and all the amazing things that happen, and that’s what you'll remember for a lifetime.